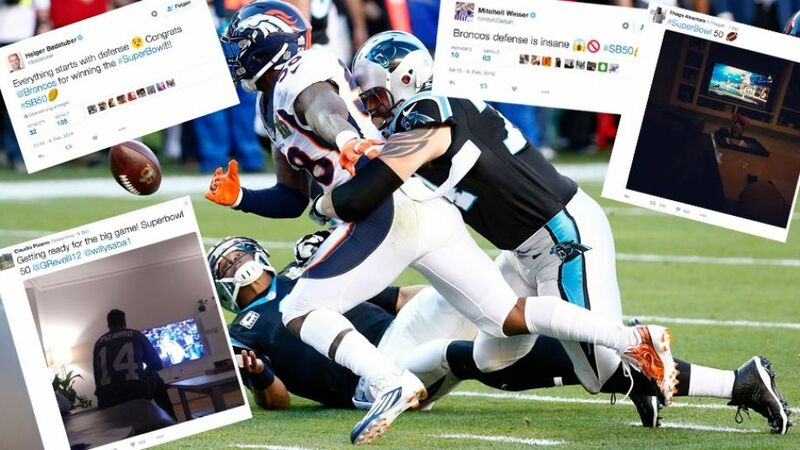 Numerous Bundesliga stars stayed up late on Sunday to follow the Super Bowl, posting their experiences of the evening on social media. The biggest sporting event on the other side of the Atlantic was a draw for many Bundesliga stars, who stayed up late on Sunday night to follow the 50th Super Bowl in Santa Clara, California. The entertainment does not stop at half-time in the Super Bowl, however. Bruno Mars, Beyonce and Coldplay's Chris Martin kept the 71,000 assembled fans happy as the players took a deserved break, and their performance also drew widespread approval. Video: Schalke try keepy-uppy with an oval ball! Opinion was divided over who to support, with the Denver Broncos and the Carolina Panthers splitting the Bundesliga stars. Video: Bernd Leno's crossbar challenge with an American football! While the NFL stars were getting ready for the biggest moment of their season, it was time for the Bundesliga stars to sit back in the comfort of their own living room to watch on, with plenty of coffee on order to ensure getting through the night without dropping off! Video: Which Bundesliga stars got their pre-match predictions correct?